Want to know what is better than a good ole toffee bar? 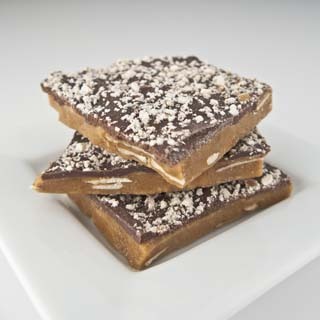 Homemade toffee! I am a toffee junkie, I love it. But, I don't love the way some toffee bars stick to your teeth like glue when you try to eat them. I was extremely delighted when I started eating the toffee pieces from Tungsten Toffee that this didn't happen! Their toffee is the best tasting toffee I have ever had! I LOVE IT! 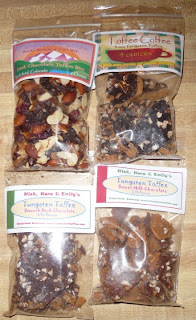 I was lucky enough to try their Milk Chocolate, Dark Chocolate, and Coffee Toffee along with their Toffee Trail Mix. They were all very good. The Coffee Toffee even had a great coffee smell when you opened the package. The Trail Mix was a nice mixture of toffee bits, almonds, cranberries, and raisins. It was a great mixture and a little healthier treat than just plain toffee alone. I had a lot of trouble sharing this tasty set of treats! I was good though I gave one of the bags to my husband after I tasted it for myself. : ) I guess it's a good thing I don't live in CO I'd be in their store ALL the time. The only thing I didn't like was their bags were tall instead of wide, I couldn't get my hand it it to reach the pieces in the bottom. Of course this didn't stop me from cleaning out each and every bag! This will definitely be on my hot list of where to satisfy my toffee cravings. Buy it: You can purchase Tungsten Toffee at their online retail store. Win it: One lucky reader will win their choice of flavor of Toffee or Trail mix. This giveaway will end Feb 26th at 10 PM EST. The winner will have 48 hours to respond to my email. If no response, a new winner will be chosen. Open to residents of the US. Mandatory Entry: (Mandatory entry must be completed first or bonus entries don't count.) Please use form for ALL entries, except daily tweets. *Visit Tungsten Toffee and tell me which flavor you'd chose if you won. 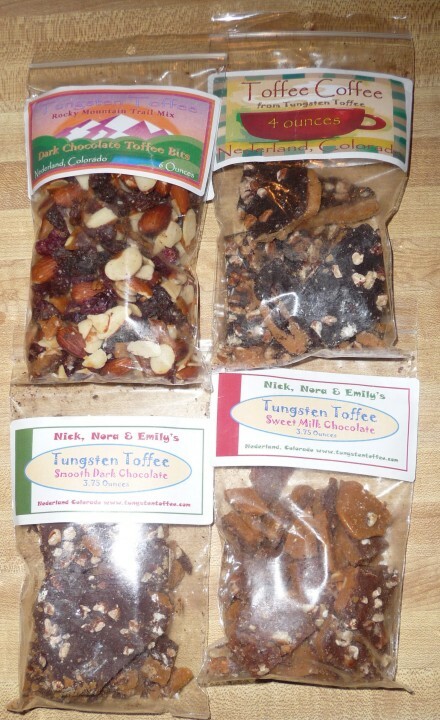 • Tweet this giveaway (may be done once per day - please leave a comment with your tweet status) "RT #win Tungsten Toffee or Trail mix HERE: http://bit.ly/az5Dls (Ends 2-26) #Giveaways"
Not sure whether my tweet comment goes here or in this form - so I did both. Thanks so much! I can't wait to try this toffee. I sent you my info.